“I can’t change the world. I’m just one person. What can I do?” We think thoughts like this and we articulate and hear others articulate versions of this statement all the time. Yet, history is replete with examples of a single person or a small group people completely transforming the landscape. The cultural anthropologist Margaret Mead once wrote, “Never doubt that a small group of thoughtful, committed people can change the world. 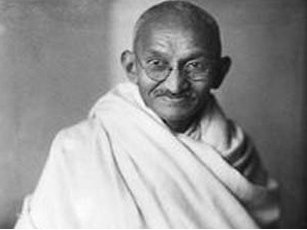 Indeed, it is the only thing that ever has.” Mahatma Gandhi, an example of one man who transformed everything, gave us the famous reminder at the top of this article that we must BE the change. Now, not everyone is going to be a Gandhi or someone who changes the world. Some of us are destined to do no more than change a moment, change our minds, elevate our thinking to see beyond old paradigms. Yet, by doing that we are transforming far more than we imagine. This I know. There is a complete spectrum of ways you can contribute. You may be on a mission to feed the hungry or eliminate injustice or you may change everything by being completely present with the people you’re with and sharing a smile or some eye contact just to say I see YOU and I know how unique and significant you are. Today’s affirmations and original quotes are for those committed to BEING the change and making a difference- whether it be to change the world, change a moment, or change a mind. My world is what I make of it and today I make it a _______ place to be! Today and every day, I do at least one thing to leave the world better than I found it. Today I lend my hands and pledge my heart to the work of creating a better world. A smile shared does the work of a hundred kind words. Always be the one to share it. Today humanity’s highest potential shines brightly through my thoughts, words, and actions! A smile can open doors that a word could never budge. Today I AM the change I want to see in my world! Whenever and wherever I encounter darkness, I consciously spread light. I/We created my/our status quo and I only I/we can change it. Today I am a force for good in my world in every way I affect it! Everything enters the realm of possibility when you release the power of the status quo. Break its chains! Escape its gravity! Whenever and wherever sadness reigns, I share joy! Polarization benefits only those who want to maintain status quo. It’s an adversary to people looking for a way forward. I came here to serve and today I do! Today I AM the difference maker my world needs! Each and every day I am a light in my world. Peace comes to my world one person at a time, beginning with me! I absolutely believe that I can make a difference and today I DO! All growth takes place in the realms of opportunity, possibility, and potential. The status quo is a teacher, not a change agent. If being controversial shakes up the status quo, then I will shake, shake away! I am an empowered human being ready to make a difference in my world today! The status quo is nothing more than a persistently reinforced myth. The world needs my contribution! Today and every day, I make a difference! Today I make a difference by looking each person in the eye and letting them know I see their humanity. Today I play my part in sweeping away the old world and ushering a new! Today and every day, the world is a better place because I am consciously here! One heart raised, raises the whole world. Tolerance only for those who think like you and look like you, is no tolerance at all. I am committed to giving selflessly of myself for the betterment of humanity and happiness of others. Today I do! Today I depolarize my environment in every way I touch it. I am a source for understanding. I am committed to eliminating hunger in the world. My actions today are having a powerful impact. I am committed to eliminating poverty in the world. My actions today are having a powerful impact. A just peace is an achievable goal for humanity. Today I play my part in making it a reality! I am committed to eliminating injustice in the world. My actions today are having a powerful impact. As hope grows in my life, I consciously plant it in the lives of others! Wherever tyranny chains hearts, I am the loudest voice for freedom! Even when the struggle is large, my contribution positively impacts the outcome! I am committed to my work! I know I am making a difference in the lives of people! I am absolutely determined to be part of the solution rather than part of the problem! I make the world a better place in every way I touch it today. Where ever hatred is the chief crop, I sow seeds of peace. Today I am the epicenter for a peace pandemic in my world. Today I touch my own humanity by sharing it with others! In struggle for humanity’s progress and Earth’s well being, I’m pulling for both! When we forget our neighbors’ humanity any evil becomes possible. When we remember it a better world is born. empowered thought can shift a life.